At the end of a hard-fought seven game playoff series, one team moves on and one team goes home for the summer. 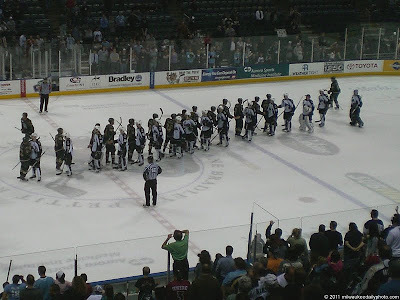 This evening, the Admirals lost the game 4-2 and the series 4-3 to the Houston Aeros. After the series is over, the teams shake hands and congratulate each other on a good contest, as is tradition in hockey.